Alzheimer’s can prevent seniors from enjoying activities that require planning or reasoning skills. Nonetheless, there are still plenty of activities that may bring them joy while stimulating their creativity, memory, and senses. Here are six activities appropriate for aging adults with Alzheimer’s. Sensory stimulation can be therapeutic for seniors with Alzheimer’s. It can bring up old memories, soothe them when they feel anxious, and give them a deeper connection with the external world. 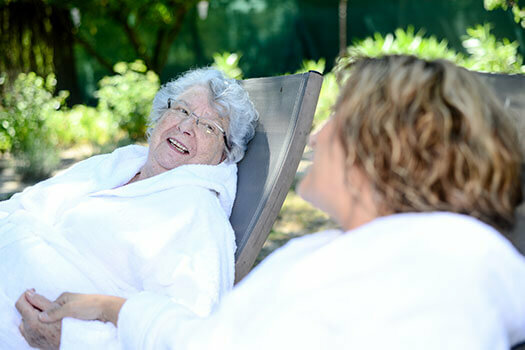 At-home spa activities are a popular form of sensory stimulation for seniors with Alzheimer’s. Try giving your loved one a hand massage with fragrant oils or lotions, or soak his or her feet in a scented footbath. While seniors with Alzheimer’s may have difficulty understanding the plot of a movie or the flow of a conversation, they often retain the ability to process music. Beloved songs can elicit long buried memories and lift their spirits. Create a playlist of your loved one’s favorite songs and play it whenever he or she needs an emotional boost. Encourage your loved one to sing along if possible. For seniors in the early and middle stages of the disease, doing simple household tasks can give them a sense of accomplishment and independence. Have your loved one fold towels, wipe wet dishes dry, and set the table. Household chores can also double as mental stimulation. Ask your loved one to sort socks, mail, or silverware. When seniors can maintain their favorite hobbies, it can be very fulfilling. Adjust your loved one’s former interests to his or her current abilities. If your loved one used to garden, give him or her a few indoor plants to care for. If he or she enjoyed oil painting, watercolors may be a suitable substitute. Crossword lovers may appreciate a simple jigsaw puzzle, and knitters can braid yarn or cord. Some older adults may have difficulty managing physical tasks such as gardening and knitting. An in-home caregiver can assist with these activities and much more. Seniors who want to remain healthy as they age can benefit in a variety of ways when they receive professional home care. Montgomery, AL, Home Care Assistance is here to help your loved one accomplish daily tasks, prevent illness, and focus on living a healthier and more fulfilling life. Seniors with Alzheimer’s may find it challenging to follow the steps of a recipe, but they can help out with simple baking tasks. Select an easy cookie recipe with minimal ingredients, and then have your loved one perform simple activities like sifting, stirring, and scooping. Decorating the cookies can also be fun. Give your loved one a brightly colored selection of sprinkles and sugar, and let him or her decorate each batch of cookies. Seniors often enjoy interacting with pets because they provide uncomplicated affection and comfort. Take your loved one to visit the pet of a friend or family member, or contact a local therapy dog service and inquire about home visits. Seniors may also have fun taking a trip to a local aquarium or zoo, as they provide plenty of visual and auditory stimulation. In-home caregivers are available to help seniors with Alzheimer’s disease remain healthy and active while aging in place. When considering elderly care, Montgomery, AL, families should make sure their senior loved ones have the resources they need to maintain their independence and remain healthy. Trusted in-home care professionals can assist seniors with daily tasks like cooking, bathing, and exercise, and they can also encourage them to focus on healthier lifestyle habits. Call one of our knowledgeable Care Managers today at (334) 593-3988 if you’d like to learn more about our premier home care and schedule a free consultation.